The units feature several relief valve options, ranging from the simple single-stage relief valve to more sophisticated pneumatic relief systems. Capabilities include spray, ribbon coating, direct contact, and high-speed jetting adhesive dispensing guns and are ideally suited for a range of packaging, paper converting, graphic arts, non-wovens and product assembly applications. Teflon®-coated tanks reduce char buildup for easy maintenance and reliable operation. Independent, redundant over-temperature circuits and system over-pressure protection provide safe operation. Compatibility with industry standard hoses, guns, tank filters and drain valves. Solid-state controls, precise RTD temperature sensors, and thermostatic temperature control optimize system performance. Outlets for six hoses and guns allows for optimal flexibility. 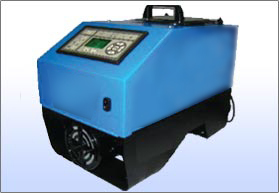 Positive displacement, motor-driven gear pump offers a continous pulse-free output. Drive ratios are matched to each specific application. Teflon®-coated tanks with cast-in heaters are available in a range of sizes, grids, and hoppers. Units feature several relief valve options, ranging from the simple single-stage relief valve to more sophisticated pneumatic relief systems. For ease-of-use, a unified operator interface is used across the entire range of D-Series units. The 4 litre unit is ideally suited for a range of packaging, paper converting, graphic arts, non-wovens, and product assembly applications. Applications include spray, ribbon coating, direct contact, and high-speed jetting adhesive dispensing guns. The unit uses a large, reliable 1/4 horsepower motor. Large capacity gear pump delivers 60lbs/hour. 100% Compatibility with industry standard hoses and guns. Independent control of each heated zone (up to 5) minimizes adhesive degradation and permits precise, uniform patterns. Outlets for two hoses and guns allows for user flexibility. 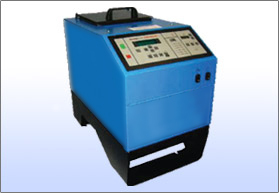 Positive displacement, motor-driven gear pump offers a continous pulse free output. One mechanical relief valve or optional pneumatic relief valve. Units feature an easy-to-use touch pad with a bright LCD screen which allows operators to quickly setup system parameters and monitor system operation with no confusing codes.